There is no quicker way to win me over than to begin a film with a beautiful montage of Italy and the equally beautiful voice of Frank Sinatra. 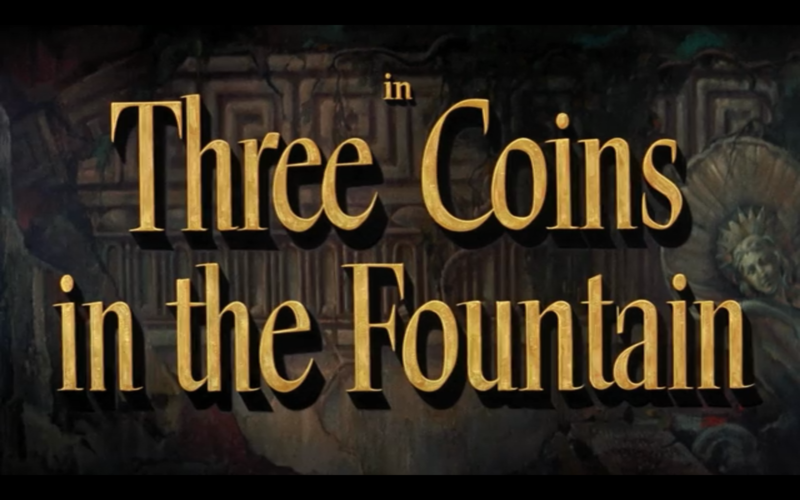 And that is exactly how it all starts for 1954’s romantic drama Three Coins in the Fountain. After the lovely opening, the film follows three American roommates who are working in Italy as secretaries. They live in a beautiful villa. 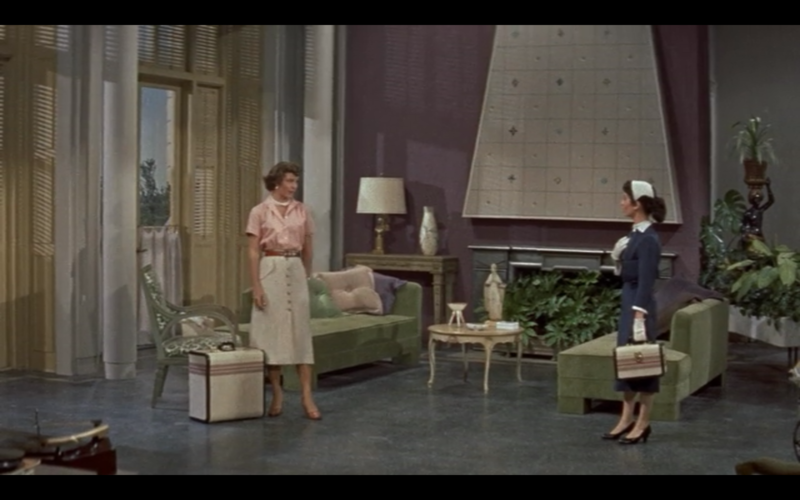 Anita (Jean Peters) and Maria (Maggie McNamara) work at an agency. 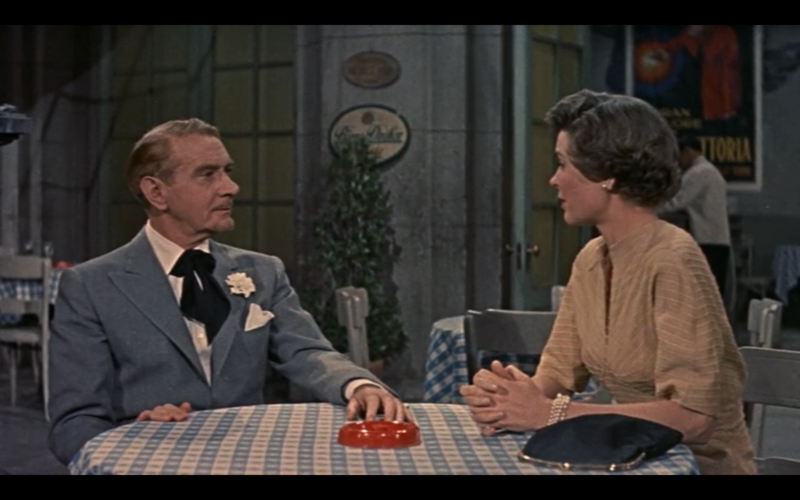 Miss Frances (Dorothy McGuire) has lived in Italy for many years, and started at the agency but works for American writer John Frederick Shadwell (Clifton Webb) in the film’s present. Miss Frances and Maria throw coins over their shoulders into the fountain. Maria is new to Italy, and soon after she arrives, her roommates decide to take her on a little walking tour. While exploring, they come upon the Trevi Fountain. Miss Frances and Maria decide to make wishes and throw coins in the mystical fountain. 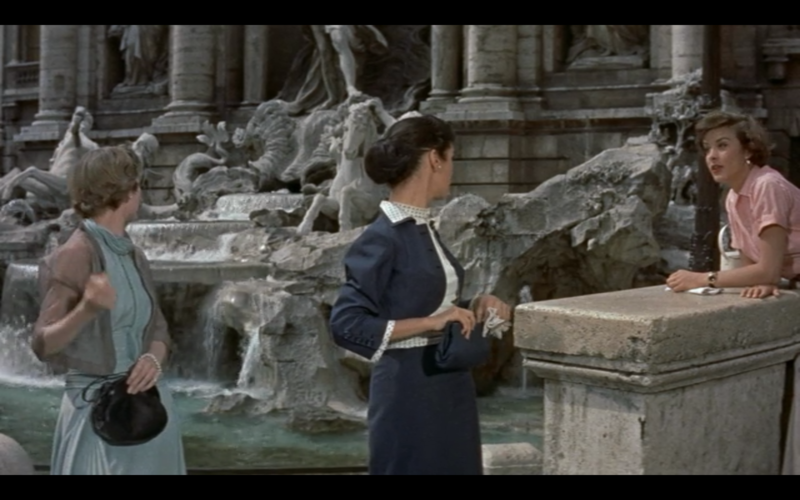 Though their fountain wishes are for general happiness, all three women hope to find the perfect men for them, and each falls in love during the film. For Miss Frances, it is her boss, Mr. Shadwell, who she has been in love with for fifteen years. Anita falls for an Italian man named Georgio (Rossano Brazzi) who works for the agency. 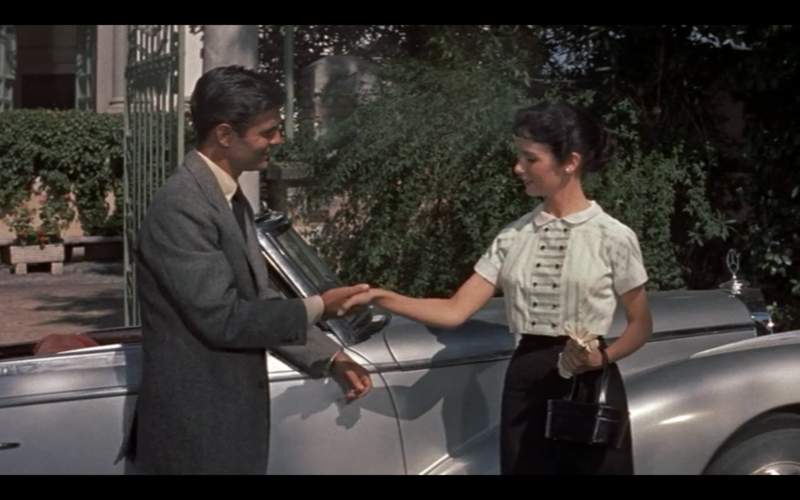 Maria seems to really strike gold, falling for a prince named Dino (Louis Jourdan). Will the fountain’s powers work magic on these budding relationships? The main characters of this film are very lovable. The women are kind and friendly – the type of people that you would want to live with and form friendships with. As a result, their budding romances are adorable to watch. Since the three women are so sweet and pleasant, the viewer instantly wants them to find happiness. A bit too much focus is put on the couple of Dino and Maria, in my opinion. They’re cute, but very storybook. The other couples are more interesting to watch, more endearing. Anita’s romance has the “forbidden love” cliche going for it, as the secretaries of the agency aren’t supposed to mingle with the Italian men who work there. Miss Frances is relatable to anyone who has dealt with unrequited love. These two scenarios are much more believable than Dino and Maria’s romance. This could be because Dino is a prince, and the concept that this woman would show up in Rome only to immediately meet and fall in love with a royal stretches reality a bit too much. Despite the lopsided focus, the viewer wants the best to happen for all of the women, and unfortunately things aren’t always peachy for them. Complications do arise in their relationships, some of which are very sad to watch. *All screen captures used in this review were taken by me while watching the film.